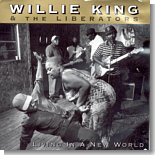 Some of the most thought-provoking blues is coming from Mississippi artist Willie King & the Liberators. King's second CD for Rooster Blues, Living In a New World, is this month's Pick Hit. A trio of Detroit R&B veterans got together at a barbeque earlier this year, and that meeting led to the excellent CD, Motor City Rhythm & Blues Pioneers. It's this month's Surprise pick. So many great re-issues and so little space ... so we feature two CDs in this month's Flashback: the double-CD release from The Hollywood Fats Band and a look back at a 1997 Carl Weathersby disc. This month's What's New section includes new releases from Solomon Burke, Rick Lawson, Big Al Carson, Cyril Vance, Lee McBee, Al Blake, Norton Buffalo & Roy Rogers, Bo Dollis & The Wild Magnolias, Cedell Davis, Arizona teen guitar slinger J.D. Simo, and more.